We are glad you and your family are here, and hope your experience is a blessing for you. Your children are always welcome to participate in worship. 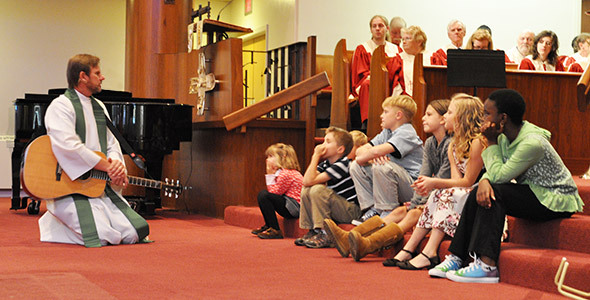 Most worship services include an opportunity for children to go forward for a children’s message. Pastor Mantey will invite children up and will share a simple message of God’s love with them prior to the sermon. During the service, there are activity bags hanging on a tree behind the last pew. These bags contain a variety of books for young children, as well as coloring and activity pages. Next to the tree is a lending table of books. This selection of books for slightly older children is available for use during the service. (If your child is interested in other books for check-out, the library is located upstairs in the education wing, Room 201.) A “treasure map” of symbols and signs (left), a weekly activity page, and a stained glass coloring book are also available. Ushers have these available upon request. Immediately following the children’s sermon, children 6 months through 3 years may accompany two volunteers to room 202. All volunteers who work with children at Saint Mark have cleared a background check. During the sermon and prayers, these children may play together until it is time for communion. There is a nursing and change area located in the balcony. As you enter the balcony, you will notice a glass partition toward the back. In this area you are able to hear the service while comforting your child. Saint Mark has an open table practice for Holy Communion: all are welcome. If you would like your child to receive a blessing only, simply indicate that to the server during the communion time. Other instructions will be given during the liturgy. During the school year, options for children during the 9:45–10:45am Education Hour are offered by age. Additionally, Room 202 in the educational wing is open for a parent to take their baby/toddler to be with others of the same age. This room is equipped with toys and games, and used during the week by the Saint Mark Child Development Center.